– Found a technique to execute any binary file after another application is closed without being detected by Autoruns.exe. reg add "HKLM\SOFTWARE\Microsoft\Windows NT\CurrentVersion\SilentProcessExit\notepad.exe" /v MonitorProcess /d "C:\temp\evil.exe"
Last time I found a way to execute DLL files and still hide from Autoruns.exe. This time I found some interesting stuff, that I have not found that much related information on and hopefully it will help people detect someone if they are using this technique. This adventure started out when I was looking for other ways to execute data from alternate streams. Somehow I ended up in Process monitor (big surprise) and started looking at the Image File Execution Options. Normally I would just pass by these, since I always assume that someone has probably already discovered all there is to discover. Again it turns out that assumptions is the mother of all fu**ups. 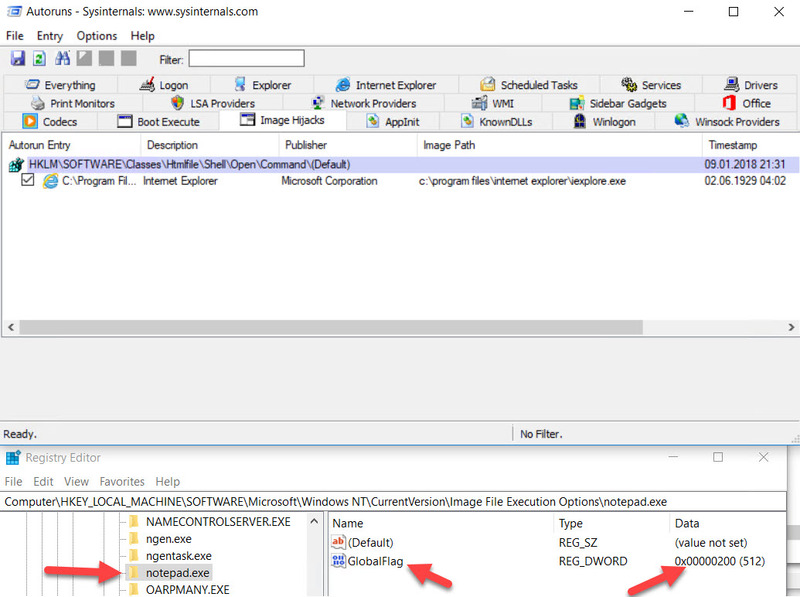 If you play with gflags.exe more, you will found more interesting registry values under Image File Execution Options. 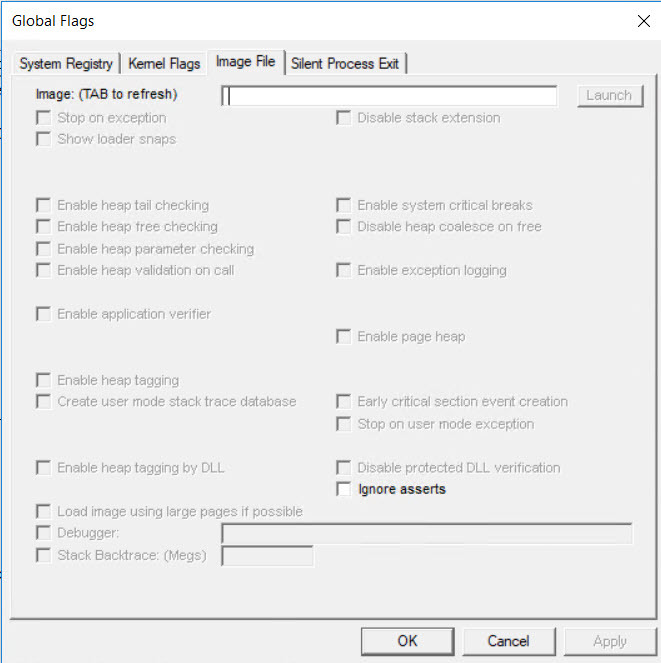 This application can be used to change all the flags related to the execution of a binary. Here could also be more interesting stuff to dig into that I have not looked at yet. As you can see, my evil plan here is to execute an evil binary every time notepad.exe is closed. After planting this I verified that it worked by running just a renamed version of bginfo.exe. The point here is not the payload I am running, more the technique. All that gflags.exe does is actually only write the registry keys necessary. To achieve the same with some simple commands you could simply run the following lines in cmd. This is also pretty good documented at docs.microsoft.com. I’ve got asked by some people since my last post on why I disclose these things, and my attentions are pure. Many people fear that this is like giving away techniques to the bad guys, but I feel disclosing these things makes is possible to discover them in the wild and create good detection mechanisms and prevention. I have also seen a lot of discussions on Twitter lately about people not wanting to disclose their techniques since it makes their job more difficult (pentesters) and that makes me sad in some way even though I can understand and relate to the reasons. My reasons for sharing things I discover is to make things more secure for everyone and hopefully it will also inspire others to start their own research and disclose new and unknown stuff to the public. Hope you enjoyed the post and as always, feedback is always welcome! Interesting article. There is an additional method for persistence that I haven’t seen anyone check for which also requires admin rights. The initial functionality is for process debugging and is enabled in a similar fashion. It basically allow you to run something prior the “debugged” process starting with the purpose of debugging attachment. I remember reading about the functionality at some point in a book and wondering why nobody uses this as a persistence method. I know I tested it and it worked like a charm. I think you are thinking about debugger that you can set in registry. This has been known for many years and malware use it all the time. 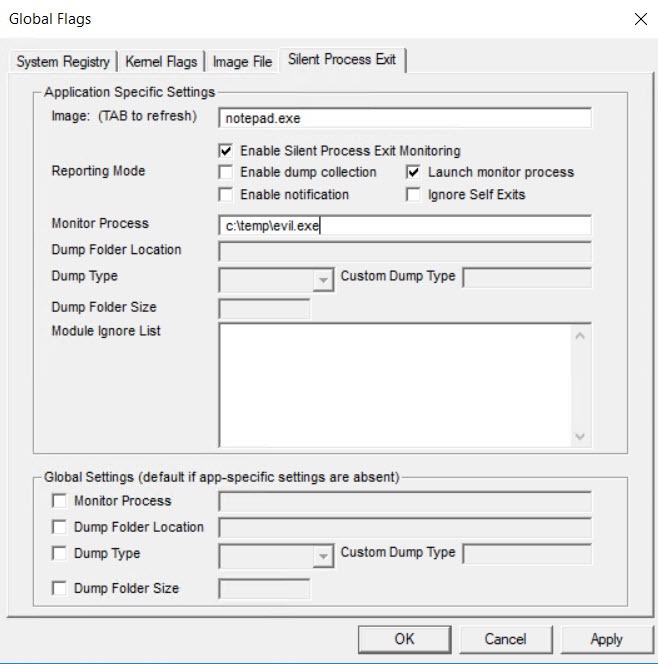 Even process explorer uses this technique if you choose to change it to the default task manager. This has been around for a long time and any developer worth a damn knows about it. I think you’re safe in sharing and linking to the MSDN documents that describe its usage.